As what I have been posted in my previous post, I have been living in the UK for about 6 month. I am currently doing my master degree in the UK. For your information though, I come to UK with not much money. Limited budget on the wallet..
Short story short, I cannot afford to go to the salon to have my hair treatment just like what I usually do back in Indonesia once every month. I can't also bother to buy the hair treatment products available in a market. I don't know why I become so picky in consumption ever since I arrive in the UK. Because of the high level of stress and pressure the university had given me in the past 6 month (thanks a lot Strathclyde) plus having my hair highly "untreated", the unexpected happens. My hair starts to complain. It has break outs, dandruff, and massive hair fall (yuck!!!). I was frustrated. I browse in the internet to find the cheapest solution for my hair. Finally, I found one website that answers it. I tried it. And it works like MAGIC..! So this post will share a simple DIY (Do It Yourself) tutorial that works like magic. All the thinks I need is there right in my kitchen. First we need 1 egg. Egg whites are packed with protein, and egg yolks are rich in vitamins including vitamin D, which promotes hair growth. According to stophairlossnow.com, the fatty acids in egg yolk reduce problems with fly-away hair and give locks a luminous appearance. Then, 5 table spoon of mayonnaise. Mayonnaise helps to diminish split ends. According to allhairlosstreatments.com, some regular users of mayonnaise conditioning treatments say they slow both graying and hair loss. Last but not least, 1 table spoon of extra virgin olive oil. It has been a public secret that princesses in the old age had used olive oil to keep the moisture of their skin and hair. The olive oil is optional though. If you have oily hair, I do not recommend you to add olive oil. But if your hair is like mine, very dry, I highly recommend you to use the olive oil. To do it is very simple. Crack the egg, put in the bowl, then mix together with the mayonnaise and olive oil. Then shampoo your hair as usual. After that, dry your hair until it is just 50% - 70% dry. Then generously put the mixture all over the hair. Make sure you focus more on putting it on the bottom part of your hair. Then clip your hair up. Cover your head with a plastic bag. The plastic bag will add the heat and helps the mixture to absorbs better to the hair. Leave for 15 to 30 minutes for it to absorb. 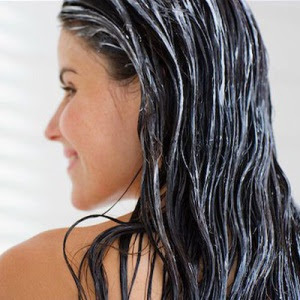 After it is done, rinse clean your hair with a cool water. Don't use hot water. Don't use shampoo. Dry your hair accordingly. Your hair will not smell good after that. So I recommend you to do this treatment at night so you can shampoo it in the morning to have the natural glow and great smell. I will do this once a week to have my hair back to recovery..
good tips, i will try it, hope its work for me too!